Make existing, unobstructed openings safer with MSU retrofit grates. Simple to install and use, MSU retrofit grates attach to support angles anchored to the concrete below the existing hatch opening. 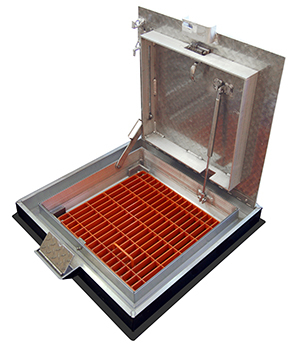 The grates are painted safety orange for high visibility and rated for 14.4 kPa (300psf) live load. Simply measure the clear concrete opening of your existing hatch and we will prepare a drawing, like the drawing on this page, for your review and approval.